When I respond with this most people shake their head. It’s not really understood. Simply because one is wearing a tie, a jacket, or a pocket square does not always mean that they are trying to be formal. In fact it shouldn’t. Clothes are merely a blank slate. Beyond their main purposes of protecting the body from the elements (cold, sun exposure, rain, snow, etc), and covering ourselves for modesty, clothes operate as social signals to other people, and a means of personal expression. But, what exactly is a casual tie? I’ve searched for a good definition, and remain unsatisfied. A casual tie seems to have two definitions. The one I’ve encountered seems to be more common, but unsatisfactory. This is the idea that a “casual tie” is a normal tie worn in a casual outfit. You take a tie that you’d wear with a suit or a jacket and slacks, and you put it on with a pair of jeans and a cardigan. Your outfit is casual, the tie simply exists as a part of that casual outfit. It is not itself, intrinsically casual. I have an alternative definition. A casual tie is one which, either due to pattern, fabric, size, wear, or other intrinsic quality of the tie, creates or fits with a more leisurely and laid-back appearance. I have a number of such ties, ranging from the high end, to vintage ties. One of the more common ties, that I believe fit this definition are your standard knit ties. While at home with a suit, their loose fabric and construction create a more casual look, either with a suit, or they fit perfectly with a pair of jeans or khakis. Similarly, slimmer ties are usually less formal, though recently, all ties have favored a slimmer construction. Personally though, my favorite are the ties that border on the absurd: camouflage, skull and crossbone patterns, leopard print, and a tie literally made of wood. Ties that completely buck any sense of formality, but hide in the context of what is usually a very buttoned up accessory. And it can confuse the heck out of people. But that’s part of the fun, and the point. The point is, you’re not actually trying to be serious. However, that doesn’t mean you still don’t look good wearing it. You’re joking, but the confidence in which you make the joke makes all the difference. And this is perhaps my favorite part of men’s fashion, that seems to be unique. It’s a sense of irreverence and of irony. Not to be confused with wearing a wearing a goofy golf tie because you like to golf. You are not wearing a skull and crossbones tie because you are a pirate, an undertaker, or poisonous. It is worn because there’s a delicious irony to it. It asks the viewer: “Wait, is he serious? No, but maybe?” It’s a wink and a smirk that you wear on your clothes. A private joke that you carry. I would encourage everyone to try to find an accessory that gives them a sense of wearing an inside joke. It creates a pep in the step that carries throughout the day. So find whatever casual tie speaks to you. 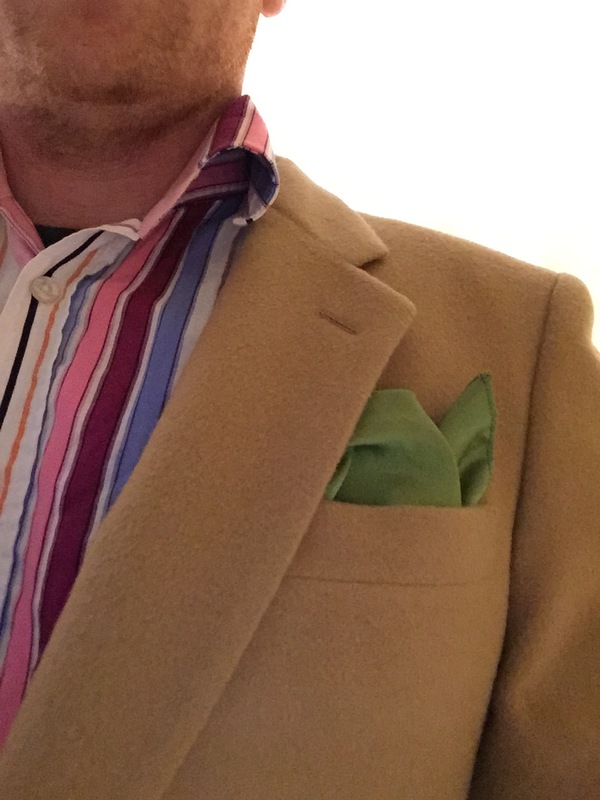 And don’t be afraid to have a similarly casual pocket square to go with it. Today’s fold is a One Point Puff. A fairly informal fold, it adds some texture to the puff fold discussed yesterday. Apologies for the repeating square, but I am currently traveling. 1. Start with your square hanging. Try to get it to hang in sort of a triangle. 2. 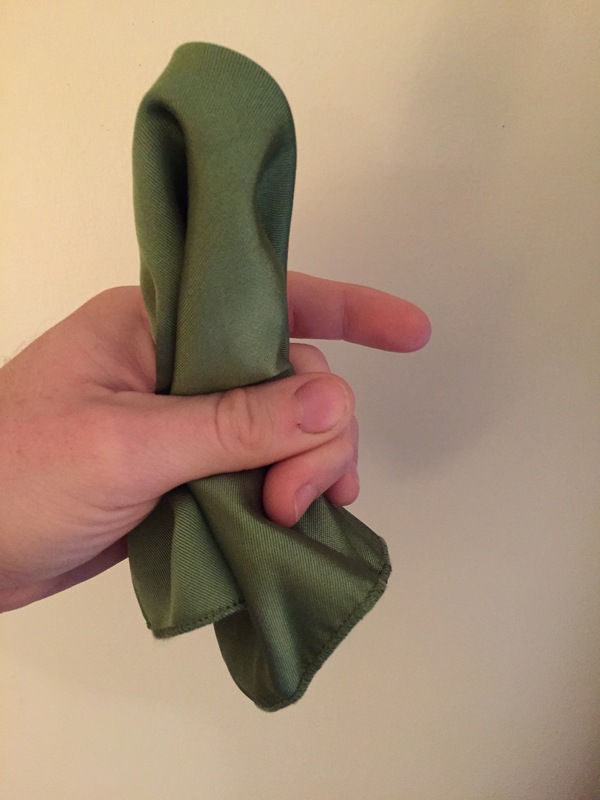 Draw it through your hand in a circle to make the puff. Try to keep in mind which of the corners is on the outside of the triangle, rather than the one facing down. 3. Pull up that corner to slighty above the top of the puff and make a peak. 4. 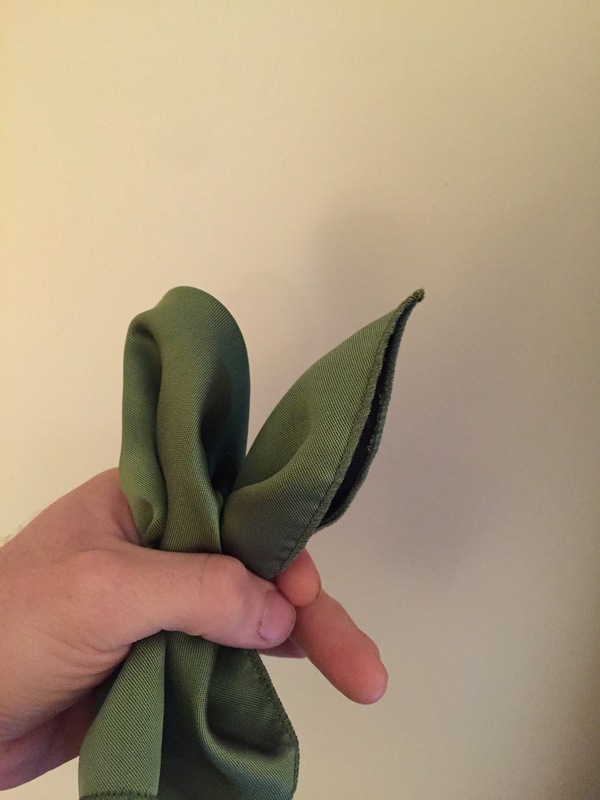 Fold up the bottom of the square to lock in the fold. 5. Insert into jacket. 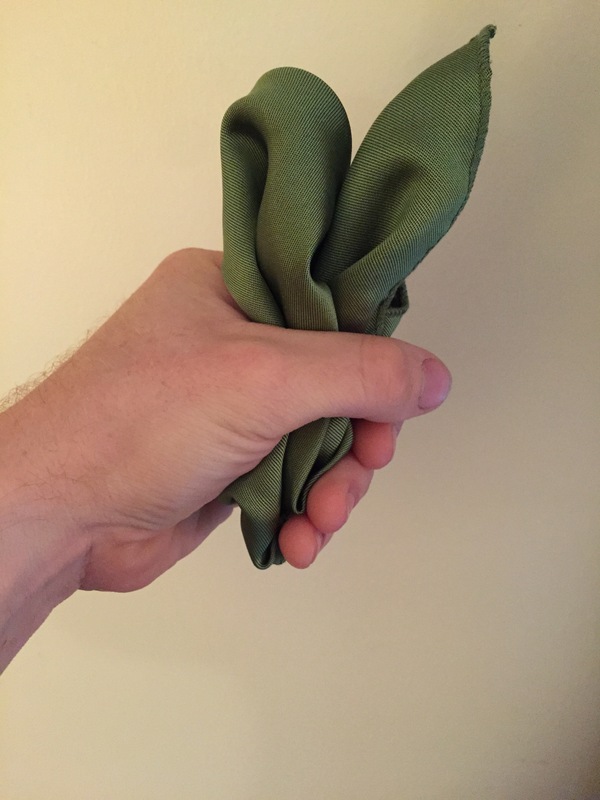 This fold requires a great deal of arrangement once it’s in the pocket. To get the puff right, as well as ensure that the point is adequate. 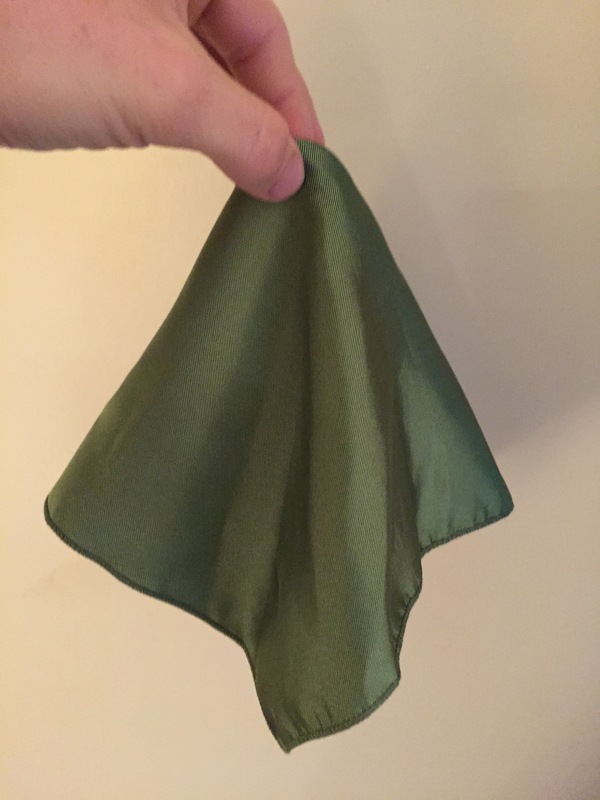 For this fold I’d recommend a silk pocket square. The softer material will lend itself to the easy going nature of this fold.